iv, 146, 10 p. : ill. ; 23 cm. matrix of the Tampa Formation. to scientists visiting Florida and also to University students. Introduction .............. ............................. ... 1..
Florida. The repository of the types and figured specimens is the U.S.
National Museum or Florida State University as indicated in the text. Dr. Vaughan more than I.
I wish to express my thanks to Dr. David L. Pawson and to Dr. Maureen E.
from Ballast Point, described by Bernard in 1906.
upon its completion, for its publication by the Bureau. permission in the same format as he submitted them to me. considerable amount of original stratigraphic data he has relayed on to us. are in a wretched state of preservation, but Mulders has done well with them. by him, the report on which is now awaiting publication. Siderastrea silicensis Vaughan* (at Tampa brickyard). chee formation of southern Georgia and northern Florida." published, and most of them therefore must be classified as nomina nuda. Three of the above-listed taxa-Orbicella tampaensis, Orbicella tampaensis var. nomina nuda and typonyms erected in 1915.
the fossils, like those from Ballast Point are completely silicified. 3. Sixmile Creek (TSM). SE % Sec. 14, T29S, R19E, Brandon Quadrangle. subsurface beneath the Honeymoon Island-Dunedin Beach area. aucillana, n. sp., also described in this paper, was collected by Joseph E.
Banks at the locality given below. County, in the vicinity of the Aucilla River where it flows underground. feet. The specimen is calcareous. the limestone breaks down into greenish clay and the fossils become silicified. the spiral univalves taper to a transparent needle-like point." Ballast Point are equivalent to the lower beds excavated at Sixmile Creek. Sixmile Creek is about 10 miles northeast of Ballast Point. determine, but suspect it does not exceed twenty feet." Dark gray sand and soil zone. Light orange-yellow, medium- to coarse-grained sand. identification of the taxon difficult or impossible. in diameter, some are tubular, and others are irregular in shape. waters should have silica in true solution only. of temperature, pressure, and concentration of silica in solution." matter contained in the deposit. apply to corals of all ages and of diverse regions. fossils was given by Mansfield in 1937, pages 8-22.
and assigned a lower Miocene or upper Oligocene position to the deposit. guide fossil of the Tampa Formation. fauna in the transition ground between the Miocene and the Oligocene. and on this criterion might well be considered Oligocene in age. and is equivalent to the Helvetian Stage of Europe. Formation of Anguilla, which is early Miocene. mollusks, suggest an "Aquitanian" age. Vernon (1964) in Special Publication No. 5 of the Florida Geological Survey. suggest a faunal break of some magnitude between those two formations. upper Oligocene, and the Crystal River Formation upper Eocene. Suwannee Limestone of late Oligocene age. Stylophora silicensis Weisbord, n. sp. Acropora tampaensis Weisbord, n. sp. Siderastrea banksi Weisbord, n. sp. Goniopora ballistensis Weisbord, n. sp. Goniopora matsoni Weisbord, n. sp. Goniopora tampaensis Weisbord, n. sp. Alveopora tampae Weisbord, n. sp. Favites yborensis Weisbord, n. sp. Montastrea davisina Weisbord, n. sp. Montastrea peninsularis Weisbord, n. sp. Cyphastrea tampae Weisbord, n. sp. Galaxea excelsa Weisbord, n. sp. Syzygophyllia tampae Weisbord, n. sp. Stvlophora silicensis Weisbord, n. sp. Acropora tampaensis Weisbord, n sp. Sidcrastrea banks Welsbord. n. sp. Gonmopora balhstensis Weisbord, n. sp. Goniopora marsoni Weisbord, n. sp. Goniopora rampaensis Welsbord, n. sp. Montastrea davisina Weisbord. n. sp. Cvphastrea tampae Welsbord, n. sp. 1900. Stylophora minutissima Vaughan, U.S. Geol. Sur., Mon. 39, p.
131, pl. 13, figs. 13-15. 1915. Not Stylophora silicensis Vaughan, nomen nudum, in Dall, U.S.
Nat. Mus., Bull. 90, p. 18. 1919. Stylophora minutissima Vaughan, U.S. Nat. Mus., Bull. 103, No. Animalia, pars 28, p. 234.
calices are shallow, and are arranged in regular ascending spirals. Locality.-Russell Springs, Flint River, Georgia. Geologic horizon.-Vicksburgian stage, Ocala Group. difference are: The calices of St. affinis are circular, while in St.
ridge exists in St. minutissima." to the slightly larger ones covering the whole of the coenosteum. 0.5 mm, and the wall is vertical. the directive lamina is the columella. below the level of the calicular margin. mm x 5 mm. Specimen TB-2c: corallum length 29 mm, average diameter 6 mm. corallum length 25.5 mm, diameter 6 mm. chalk bed and are completely calcareous. Two specimens of Stylophora cf. Formation at Dunedin Beach (Honeymoon Island), Pinellas County, Florida. River, a short distance upstream from Bainbridge, Decatur County, Georgia. normally on S. minutissima at the type locality. the Tertiary coral reef, near Bainbridge, Georgia. 1915. Stylophora silicensis Vaughan, nomen nudum, in Dall, U.S. Nat. Mus., Bull. 90, p. 18.
but do not know, that the emendation was also made by Vaughan. arise oval or elliptical and flattish on the sides. 1.0 mm to 1.4 mm. The coenosteum between the calices is finely granulate. comprising part of the primary cycle is present and intercepts the columella. maximum spread of branches 16.5 mm, diameters of main stem 10 mm x 8 mm. corallum length 28.5 mm, maximum width 16.5 mm. Sixmile Creek are all referable to S. minutissima Vaughan. Anguilla, Trinidad, and the Chipola Formation of Florida (Weisbord, 1971, pp. 15-17, pl. 2, figs. 5-7; pl. 3, figs. 1-5). Unfortunately, available specimens of S.
two species eventually prove to be identical, S. imperatoris will have priority. 1915. Acropora tampaensis Vaughan, nomen nudum, in Dall, U.S. Nat. TB-1 la) extending about a millimeter or so above the level of the coenosteum. united in a short series. within the calice, strong synapticulae connecting the sides of the septa are seen. costae but generally there are fewer than that on individuals of average size. replacement process appears granulate or reticulate or costulate. TB-1 c: stem length 46 mm, diameters 17 mm x 12.5 mm. Panama Canal Zone and from the Oligocene Antigua Formation of Antigua, A.
two. Also the coenosteum of A. saludensis is denser than that of A. tampaensis. preserved and are considered paratypes. 40 septa, to 6.1 mm x 5.5 mm, with 54 septa. smallest, fuse to the included quaternary ones. millimeter of length on the septo-costae. Locality.-Sixmile Creek south of Orient Park, Hillsborough County, Florida. Tampa, taking into account the total thickness of the Formation. corallum of S. banksi, a character not revealed on other species of the genus. provided valuable and often new stratigraphic information concerning them. 1915. Siderastrea silicensis Vaughan, nomen nudum, in Dall, U.S. Nat. 517, pl. 116, figs. 1, la, 2, 3; pl. 117, figs. 1, la, lb;pl. 118, figs. Anamalia, pars 28, p. 133. Anamalia, pars 35, p. 373.
mm. wide. Depth of calices, 1.5 mm. from the wall to the columella. expected from the relatively coarse septal trabeculae. 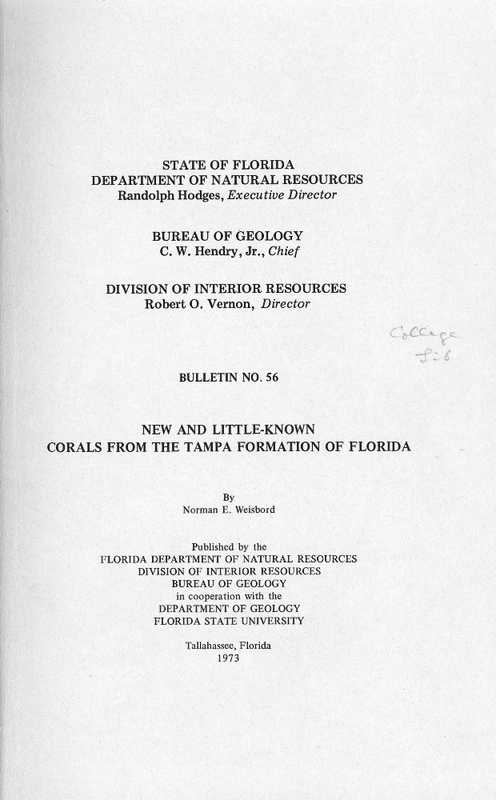 forms in the collection of the Florida Bureau of Geology (TB-12a), which Dr.
and an acutely tapering base. A number of large fragments (SM-13) collected in Sixmile Creek by Dr.
of the septa is dentate, the dentations numbering about 10 in 3 mm of length. developed. The surface of the columella is papillary. varying from 4 mm x 4 mm, with 44 septa to 10 mm x 6.5 mm, with 88 septa. the septa are distinct and aligned in close radial columns. spaces between the septa, the interseptal casts thus produced may be perforated. on the sides of the septa. came from beds 4 to 6 in composite section "C". early Miocene in age, the Hawthorn early to middle Miocene. locality No. 2, above, and to Siderastrea conferta (Duncan) (1863, p. 422, pl. Canal Zone, and Puerto Rico. The main difference between S. silecensis and S.
unit of length on S. conferta. genus Porites, pt. 2, pp. 18, 71, 126, 136, 142, pl. 12, fig. 2. 1919. Porites willcoxi Vaughan, nomen nudum, U.S. Nat. Mus., Bull. 103, No. 9, p. 211. Anamalia, pars 28, p. 273.
divide into fresh whorls, branchlets from neighboring whorls fusing together. been entirely confined to the rings of rounded interseptal loculi. thin, wavy, lamellate, horizontal layers are very marked. structure of the calicles at the surface (cf. P. West Indies X. 17, and P1. V. fig. 5). like it, inasmuch as each calicle still shows as a depression. characters as these would be easy to recognize. plate 9, figures 3 and 4. Type specimen.-British Museum (Natural History). Geol. Dept. R. 2343.
among them TB-10b which is club-shaped. with, in one row for example, 10 tightly joined calices in 13 mm of length. columella is often recrystallized into a small plug with a minute tubercle on it. columellar area or a little to the side of it. x 7.5 mm, diameters at smaller end 6.5 mm x 6.0 mm. mm) than on the sides and is flattish to slightly undulated on top. septa are perforated and granulated, the granulations robust. regular, about six of them in a millimeter of length. mm, diameter at base 45 mm. in the vicinity of the Aucilla River (where it runs underground). Formation and Age.-Suwannee Limestone. Upper Oligocene. resembles Goniopora decaturensis Vaughan (1919, pp. 490, 491, pl. 143, figs. as can be determined from the literature G. decaturensis differs from G.
columella of G. aucillana, however, is very small. Limestone (upper Oligocene-lower Miocene) of Puerto Rico. Formation and Ponce Limestone of Puerto Rico. 1915. Goniopora ballistensis Vaughan, nomen nudum, in Dall, U.S. Nat. U.S. National Museum labeled "Goniopora ballistensis Vaughan, 3286, Tampa"
by a plate-like growth upon them. synapticulae are well developed and there are three rings of them in the wall. millimeter of length and with about seven rods in one millimeter of width. mm thick; it is built up of thin plates. Formation and Age.-Tampa Limestone (lower Miocene). ballistensis are similar to Porites anguillensis Vaughan (1919, pp. 504, 505, pl. being 12 in P. anguillensis, 15 in G. ballistensis. 1919. Goniopora decaturensis Vaughan, U.S. Nat. Mus., Bull. 103, No. 9, pp. 205, 234, 235, 346, 490, 491, 522, pl. 143, figs. 1, la. Animalia, pars 28, pp. 276, 277.
scarcely any relief due to the shallowness of the calices. appearance to the surface of the corallum. yet another calice there is a small tubercle in the center of the columellar tangle. The axial area of a number of calices is fused. mm, thickness 2.5 mm to 6.5 mm. County, Florida. Tampa Formation (lower Miocene). well enough preserved to be certain of the identity. Formation (upper Oligocene-lower Miocene) of Puerto Rico. 1915. Gonipora matsoni Vaughan, nomen nudum, in Dall, U.S. Nat. collection from Ballast Point and Sixmile Creek, Hillsborough County, Florida. and revealing the cellular structure of the corallum. costulated, the costules corresponding to the outer ends of the septa. mm and 15 mm x 13 mm. Comparisons.-It is difficult to determine whether Goniopora matsoni, n.
lack the low collins between adjacent calices such as are present on G.
1915. Goniopora tampaensis Vaughan, nomen nudum, in Dall, U.S.
specimen is siliceous and the surface drusy so that details are obscured. tertiaries diminishing slightly in size according to the order of their insertion. arrangement cannot be made out. The columella is very small and seemingly papillate. from 1.8 to 4.6 mm, the average about 4 mm. the occurrence of large pali at the inner ends of the principal septa. 1915. Alveopora tampae Vaughan, nomen nudum, in Dall, U.S. Nat. base of a solitary coral, is as follows. is flattish on top, and with gently tapering sides. crossing the columellar area is present. formed on TSM-lla by the union of the inner ends of the principal septa. in Sixmile Creek east of Hillsborough Bay. 1915. Maeandra tampaensis Vaughan, nomen nudum, in Dall, U.S.
material and many details of structure have been obliterated or altered. or three centers, suggesting reproduction by marginal fission. strongly granulated, and nearly equal in size. with two elongated cells in one millimeter of length. length 68 mm, width 41 mm, height 44 mm. Hillsborough Bay, Hillsborough County, Florida. more numerous septa in calices of comparable size. 1766. Madrepora acropora Linnaeus, Systema Naturae, ed. 12, p. 1276.
of... Zoophytes, p. 169, pl. 53, figs. 1, 2. 1791. Madrepora acropora Gmelin, Systema Naturae, ed. 13, pt. 6, p.
1791. Madrepora faveolata Gmelin, Systema Naturae, ed. 13, p. 3769.
thiere, vol. 1, p. 21, pl. 38. 1816. Astrea annularis (Ellis and Solander), Lamarck, Hist. Nat. Anim. sans Vert., vol. 2, p. 259. Mdthodique des... Polypiers, p. 58, pl. 53, figs. 1, 2. Mdthodique des... Polypiers, p. 58, pl. 53, figs. 5, 6. Mdthodique, vol. 2, p. 131. Bruguiere, Encyclopedie Mdthodique, pt. 2, pl. 486, figs. 1, 2. Sciences Naturelles, vol. 60, p. 324. 1834. Explanaria annularis (Ellis and Solander), Ehrenberg, K. Akad. Wiss. Berlin, Phys. Abhandl. 1832, p. 308.
ologie ou de Zoophytologie, p. 368. 1836. Astrea annularis (Ellis and Solander), Lamarck, Hist. Nat. Anim. sans Vert., ed. 2, vol. 2, p. 405. 1846. Astrea (Orbicella) annularis (Ellis and Solander), Dana, U.S.
1850. Astrea annularis (Ellis and Solander), Edwards and Haime, Ann. Sci. Nat. Paris, s&r. 3, Zoologie, vol. 12, p. 104.
assaing and Michelotti, R. Accad. Sci. Torino, Mem., ser. 2, vol. 1863. Phyllocoenia sculpta Edwards and Haime, Duncan, Geol. Soc. 1863. Cyphastraea costata (partim) Duncan, Geol. Soc. London, Quart. 1866. Orbicella annularis (Ellis and Solander), Verrill, Boston Soc. Nat. Hist., Proc., vol. 10, p. 323.
and Cyphastraea costata Duncan, p. 180. 1867. Heliastraea barbadensis (Duncan), Geol. Soc. London, Quart. Cyphastraea costata Duncan, p. 24; Plesiastraea ramea Duncan, p.
Spongiaires des Antilles, p. 30. 1871. Orbicella annularis Dana, Pourtales, Mus. Comp. Zool., Mem., vol. 2, No. 4, p. 77. 1877. Orbicella annularis (Ellis and Solander), Arango y Molina, R.
Acad. Cienc. Medicas, Fi'sicas y Nat. Habana, An., vol. 14, p. 278. K. Svenska Vetensk.-Akad., Handl., vol. 14, No. 6, p. 23. 1880. Orbicella annularis Dana, Pourtales, Mus. Comp. Zool., Mem., vol. 7, No. 1, pl. 4, figs. 1-10. Syst., vol. 3, p. 174. 1890. Orbicella annularis (Ellis and Solander), Heilprin, Acad. Nat. Sci. Philadelphia, Proc., vol. 42, pp. 303, 305. 1890. Heliastraea annularis (Ellis and Solander), Ortmann, Zeitschr. f.
Wiss. Zool. Leipzig, vol. 50, pt. 2, p. 307. 1890. Orbicella annularis (Ellis and Solander), A. Agassiz, Mus. Comp. Zool., Bull., vol. 20, No. 2, p. 61, pls. 1, 2. Echinopora franksi Gregory, pp. 274, 275, pl. 11, figs. 2a, b, c, 3.
vol. 28, No. 5, p. 275.
vol. 34, pp. 153, 155, 156. Jamaica, Jour., vol. 2, No. 6, p. 621. Sci., Trans., vol. 10, art. XIV, pp. 552, 553. 1901. Orbicella acropora (Linnaeus), Vaughan, Rijksmus. Geol. Min. Leiden, Samml., ser. 2, vol. 2, No. 1, pp. 8, 9, 11, 12, 22-27. Acad. Arts and Sci., Trans., vol. 11, Pt. 1, art. 3, pp. 94-96, pl. 1901. Orbicella annularis var. stellulata Dana, Verrill, Connecticut Acad. Arts and Sci., Trans., vol. 11, Pt. 1, art. 3, pp. 96, 97, pl. 15, fig. Bull., vol. 20 for 1900, pt. 2, pp. 301, 302, pls. 6, 7. 1902. Orbicella annularis (Ellis and Solander), Vaughan, Biol. Soc. Washington, Proc., vol. 15, p. 56. Mem., vol. 8, pp. 564-566, pls. 8-10 (figs. 64-73). ner, Mus. Comp. Zool., Bull., vol. 44, p. 266. Sci., Trans., vol. 12, p. 233, fig. 86. 1910. Orbicella annularis (Ellis and Solander), Vaughan, Carnegie Inst. Washington, Publ. No. 133, Papers Tortugas Lab., vol. 4, p. 109. 1913. Orbicella annularis (Ellis and Solander), Mayer, Carnegie Inst. Washington, Yearbook No. 11, p. 126. 1914. Orbicella annularis (Ellis and Solander), Mayer, Carnegie Inst. Washington, Publ. No. 183, Papers Tortugas Lab., vol. 6, No. 1. p.
Acad. Sci., Jour., vol. 5, No. 17, p. 596. 1915. Orbicella annularis (Ellis and Solander), Vaughan, Carnegie Inst. Washington, Yearbook for 1914, No. 13, pp. 224, 225. 1916. Orbicella annularis (Ellis and Solander), Vaughan, Carnegie Inst. Washington, Yearbook for 1915, No. 14, p. 227. 1918. Orbicella annularis (Ellis and Solander), Mayer, Carnegie Inst. figs. 7-7b; pl. 81, figs. 1-2; pl. 82, figs., 1-2; pl. 83, figs. 1-3a;pl. Islands, vol. 3, pt. 1, pp. 194, 195, pl. 28, fig. 2. 1921. Orbicella annularis (Ellis and Solander) Vaughan, Geol. Sur. Dominican Rep., Mem., vol. 1, p. 167. 1927. Orbicella annularis (Ellis and Solander), van der Horst, Bijdr. Dierk. Amsterdam, No. 25, p. 160. Reef Exped. 1928-29, Sci. Rept., vol. 1, No. 2, p. 25. 1932. Orbicella annularis (Ellis and Solander), Wells, Carnegie Inst. Washington, Yearbook No. 31, p. 291. 1937. Orbicella annularis (Ellis and Solander), Yonge, Carnegie Inst. 1939. Orbicella annularis (Ellis and Solander), Butsch, Barbados Mus. and Nat. Hist. Soc., Jour., vol. 6, No. 3, pp. 136, 137, pl. 1, fig. 6. Geol. Soc. Amer., Spec. Papers, No. 44, p. 321, pl. 29, fig. 5. Corals, pp. 61, 72, 89, 90, pls. 25, 26. Jamaica, Ann. Rept. 1953-1954, p. 25. Wildlife Serv., Fish. Bull., vol. 55, No. 89, p. 293. No. 2, pp. 23, 24. 1958. Montastrea annularis (Ellis and Solander), Squires, Amer. Mus. 238, 256, pl. 40, fig. 3; pl. 41, figs. 1, 2. Sci. Univ. Texas, Bull., vol. 5, p. 154. 1958. Montastrea annularis (Ellis and Solander), Zans, Geol. Sur. Dept. Jamaica, W. I., Bull., No. 3, p. 32.
and Thurber, Amer. Mus. Nat. Hist., Bull., vol. 117, art. 4, pp. 1960. Montastrea annularis (Ellis and Solander), Lewis, Canadian Jour. 1960. Montastrea annularis (Ellis and Solander), Lewis, Barbados Mus. and Nat. Hist. Soc., Jour., vol. 28, No. 1, p. 11. Nac. Marianao [Cuba], ser. Educacional No. 2, pp. 9, 54, 55, figs. len, No. 24, pp. 131, 136. 1962. Montastrea annularis (Ellis and Solander), Stoddart, Atoll Res. 142, 154, 155, 162, pl. 14a. 1963. Montastrea annularis (Ellis and Solander), Jones, Bull. Marine Sci. Gulf and Caribbean, vol. 13, No. 2, p. 282. 1964. Montastrea annularis (Ellis and Solander), Storr, Geol. Soc. Amer., Special Papers, No. 79, pp. 18, 19, 23, 45, 46, 59, 72, 80. Science, vol. 151, No. 3708, p. 343, fig. 1. 1966. Montastrea annularis (Ellis and Solander), Stanley, Amer. Assoc. 1940, 1946, pl. 1, fig. 1, text figs. 2, 3. 1967. Montastrea annularis (Ellis and Solander), Goreau and Wells, Bull. Marine Sci., vol. 17, No. 2, p. 448. Jour. Earth Sci., vol. 4, No. 3, p. 467. 1491, 1494, 1495, 1496, 1500. 1969. Montastrea annularis (Ellis and Solander), Logan, Amer. Assoc. Petrol. Geol., Mem. 11, pp. 146, 149, pl. 10, fig. 2.
vol. 44, No. 4, pp. 451, 458, 463, 465, 471, 473. Matthews, Amer. Assoc. Petrol. Geol., Bull., vol. 54, No. 10, pp. Robert O. Vernon, 30 April 1970, pp. 2, 3, 4, 5, 6, 7. 38, 39, 65-66, 94, 97, 101, figs. 4, 7, 8, 11, 26, pls. 24b, 25b. 1972. Montastrea annularis (Ellis and Solander), Campos Villarroel, Soc. Venezolana Cienc. Nat., Bol., vol. 29, pp. 548, 555, 570, pl. 7. 1972. Montastrea annularis (Ellis and Solander), Maclntyre, Amer. Assoc. Petrol. Beol., Bull., vol. 56, no. 4, pp. 730, 731, figs. 6a, 7.
identity as Montastrea annularis is in doubt. cycle the thinnest and most rudimentary of all, hardly projecting from the wall. TSM-5a: corallum height 52 mm, length 60 mm, maximum width 60 mm. Solander) and of the species synonymized with it is Oligo-Miocene to Recent. annularis are found in the Ponce and Quebradillas Limestones of Puerto Rico. most of it has been broken away. have been reported by Bonet (1958). Big Pine Key, Upper Matecumbe Key, Key Largo, and Port Everglades); St.
ft. Sandy Lane, St. James. (Puerto La Cruz; Bahia de Mochima); Brazil (Bahia de Camamu'). siliceous replacement they are relatively thin and subequal. principal septum a short distance in from the wall. The columella is not visible. 37.5 mm, width 30 mm. form has been so considerable I am not sure it is the same. Superficially M.
of smaller diameter than does the Recent M. annularis. depth to the columella is about 3 mm. width 53 mm, thickness, including chalcedonic underlay, 7 mm to 9 mm. Dall, U.S. Nat. Mus., Bull. 90, p. 18. Animalia, pars 28, p. 70.
vol. 3, pt. 3, pp. 168, 197, 198, pl. 30, fig. 1.
northeast of Ballast Point, agrees with the types in all essential particulars. represented by a faint nodulation at the calicular margin. but these cannot be seen clearly on specimen TD-la. da. Also Ballast Point and Sixmile Creek, and Puerto Rico. (Oligocene) and the Ponce Formation of late Oligocene or early Miocene age. (Duncan) from the Oligocene and lower Miocene of the circum-caribbean area. 1919. Orbicella tampaensis var. silecensis Vaughan, U.S. Nat. Mus., Bull. 103, No. 9, pp. 211, 230, 231, 362, 364, 390, 391, 513, pl. 96. Catalogus I: Animalia, pars 28, p. 70. "Corallum oblong, irregularly convex above; type about 16 cm. long, 11 cm. wide, and 9.5 cm. high. cycle small but usually recognizable. quaternaries obvious but not prominent. Type.-Wagner Free Institute of Science, Philadelphia. the better developed last (quaternary) cycle of costae." Vaughan's paratype No. 324896 in the U.S. National Museum. The corallum of TB-4a is massive, subcerioid, and more or less head shaped. formed from the inner ends of the principal septa. TD-5a and TH-2a are not illustrated in this report. dredgings in the St. Marks Formation by Forrest D. Cring. of the calice 5.6 mm x 5.3 mm. rectangular cells about .028 mm in length and .012 mm in width. suggestion that the inner ends of the septa were papillate. south of Orient Park, Hillsborough County, Florida. Remarks.-As in many of the Sixmile Creek corals collected by Joseph E.
by calcium carbonate, and is not a true pseudomorph. 1863. Astraea cellulosa Duncan, Geol. Soc. London, Quart. Jour., vol. 19, pp. 417, 418, pl. 13, fig. 10. 1863. Isastraea turbinata Duncan, Geol. Soc. London, Quart. Jour., vol. 1866. Heliastraea cellulosa (Duncan), Duchassaing and Michelotti, R.
Accad. Sci. Torino, Mem., ser. 2, vol. 23, p. 180. 1866. Isastraea turbinata Duncan, Duchassaing and Michelotti, R.
Accad. Sci. Torino, Mem., ser. 2, vol. 23, p. 183.
vol. 24 (1868), p. 24. 1867. Isastraea turbinata Duncan, Geol. Soc. London, Quart. Jour., vol. phytes et des Spongiaires des Antilles, p. 30.
des Spongiaires des Antilles, p. 31.
ton, Yearbook for 1914, No. 13, p. 360.
pl. 100, figs. 1-4a; pl. 101, figs. 2, 2a. 1921. Antiguastrea cellulosa (Duncan), Vaughan and Woodring, Geol. Sur. Dominican Republic, Mem., vol. 1, pp. 108, 109. 1924. Antiguastrea cellulosa ? (Duncan), Woodring and Brown, Geol. Sur. Republic of Haiti, p. 150. Animalia, pars 28, pp. 73, 74. Islands, vol. 3, pt. 3, pp. 167, 172, 192, 193, pl. 28, fig. 1. 1943. Antiguastrea cellulosa (Duncan), Vaughan and Wells, Geol. Soc. Amer., Spec. Pap., No. 44, p. 173, pl. 29, fig. 8. Fossils of North America, p. 119, pl. 44, figs. 1, 2. Paleontology, Pt. (F), Coelenterata, p. F405, fig. 303, 3. Sci. Gulf and Caribbean, vol. 12, No. 1, p. 69. The columella is a small wrinkled lamina. mm, length 80.5 mm, maximum width 55 mm. Miocene localities are listed for the Dominican Republic in Rio Yaque del Norte. of the Caloosahatchee was given as Pliocene. Cyphastrea tampae Vaughan, nomen nudum in Dall, U.S. Nat. Museum, Bull. original skeleton and has altered others. corallites and costulations on the projecting exotheca. spongy tangle; in some calices it intercepts a directive lamina. width 28 mm, height 27 mm. mostly covered on the USNM corallum. description based on examples in the FSU collection is given. millimeters of length on a corallite 30 mm in length. of some of the primary septa in the center of the fossa. mm x 11 mm above and 12 mm x 10 mm below. Formation and age.-Tampa. Lower Miocene. costae conterminous with the third-cycle septa. Antillia ? willcoxi (Dana) ? Gane, of 1895 and 1900? 1895. Desmophyllum willcoxi Gane, Johns Hopkins Univ. Circ., vol. 15. 1900. Desmophyllum willcoxi Gane, U.S. Nat. Mus., Proc., vol. 22, No. 1193, p. 184, pl. 15, figs. 1-3. Animalia, pars 28, p. 179.
than in the longer. The margin of the calice is irregularly dentate. small rod-like projections a sort of columella as in Flabellum. the fjords of western Patagonia. however, more compressed than in this one. Locality.-Ballast Point, Tampa Bay, Florida. cabinet of Mr. Joseph Willcox, of Philadelphia." granulate, the granulations aligned in radial rows. vermiform rods produced from the inner ends of the longest septa. height 22 mm, depth of columella 16.5 mm. Formation and Age.-Tampa Limestone. Lower Miocene. with which our specimen is identical. is a little elongated, narrowly elliptical, and spongy. mm, height 16 mm. ; width of calice (estimated) 22 mm. 35 mm. Only one specimen. Locality.-Sixmile Creek, Hillsborough County, Florida. Florida, and the Sixmile Creek form is quite distinct from that. Endopachys tampae Vaughan, nomen nudum, U.S. Nat. Mus., Bull. 90, p.
Locality.-Silex bed of the Tampa Formation, i.e. Ballast Point. 1915. Syzygophyllia ? tampae Vaughan, nomen nudum, in Dall, U.S.
Vaughan as "Type, U.S. Geol. Survey, Miocene, Tampa silex bed, Florida." evidence of having been attached. margins are strongly serrate or denticulate. triangular teeth at the periphery of the fossa. the same in size although here and there a larger one alternates with a smaller. inner ends of the septa. does not quite reach the calicular margin. mm x 22.5 mm; diameters of pedicel at its base 7 mm x 6 mm. Tampa section excavated in the Orient Park area. saucer-shaped or patellate corallum and on the character of the costae. the generic determination is tentative. faces, and are much larger than the minor septa. diameter of calice 22 mm, lesser 14 mm. conjectured that this refers to Ballast Point. erected for this species by Wells in 1937 (pp. 245, 246). 2. Paratype (TSM-2b), X 5. 6. Side view of head, X 1.7. 2115), X 2. View of calice. lex" bed of Tampa region. 6. Specimen TSM-12a, X 2.